The Old Lyme Zoning Commission listens to comments from a member of the public at Monday night’s meeting. 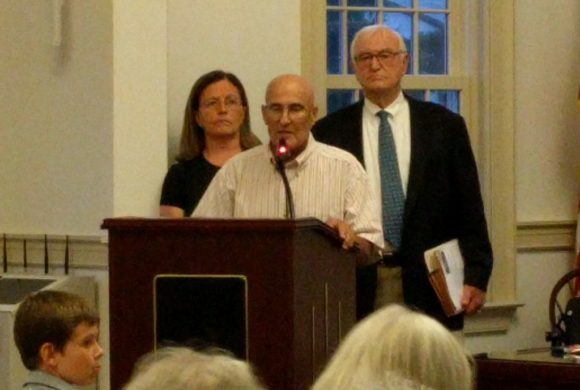 More than 250 people filled the Lyme-Old Lyme Middle School auditorium Monday evening to hear another round of comments from both the applicants and their attorney, and members of the public regarding the proposed 37-unit Affordable Housing development at 18-1 Neck Rd. (formerly 16 Neck Road). The applicants have submitted two separate applications for 23 and 14 dwelling units respectively known as River Oak Commons I and II. Zoning Commission Chairman Jane Cable (second from left) consults with a fellow commission member during the hearing. Photo by Debra Joy. Public comment was closed around 10:30 p.m. (thus meeting the legal requirement in terms of how long it can be held open) and the meeting ended without the commission taking a vote on either application. Project Engineer Joe Wren (left) of Indigo Land Design of Old Saybrook makes a point to the attorney for the applicants, David Royston, at the end of the meeting. Photo by Debra Joy. The commission now has 65 days from the closing of the public hearing to deliberate and vote. 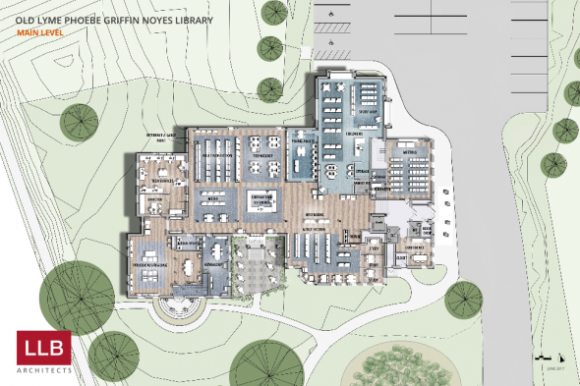 A vote on the Town of Old Lyme’s contribution of $1.75 million for renovations and upgrades to the Old Lyme-Phoebe Griffin Noyes Library is planned for July 23, at a Special Town Meeting. 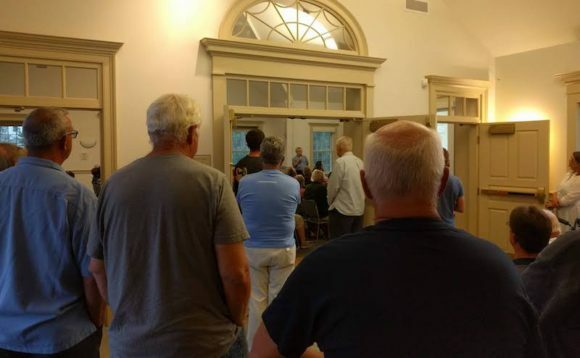 UPDATED, July 23: A Special Town Meeting will be held tonight, Monday, July 23, at 7:30 p.m. in the Meeting Hall of the Old Lyme Town Hall at 52 Lyme St. to consider a proposal to appropriate $1.75 million towards the cost of the capital construction project being undertaken at the Library by the Old Lyme-Phoebe Griffin Noyes Library Association, Inc. It is anticipated that a vote will be taken on the proposal at the meeting. This plan shows the proposed layout of the main floor after the renovation is complete. 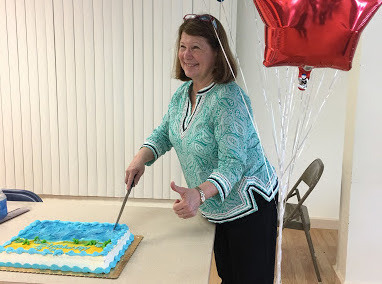 She continues, “During this time the Library has already added services, including one-on-one technology assistance, new e-collections, and more programs (a 90 percent increase), which in turn, are attended by even more people (a 140 percent increase). Finally, Huffman says, “Input from survey and focus groups during long-term planning begun in 2013 identified opportunities to meet patrons’ needs and expectations better.” This means that many of the goals set by the library in response to those needs and expectations require changes to the library’s space. The total project cost will be $3.05 million. This cost will include both construction and soft costs, such as furnishings, technology, and shelving. It also includes a built-in construction contingency fund. 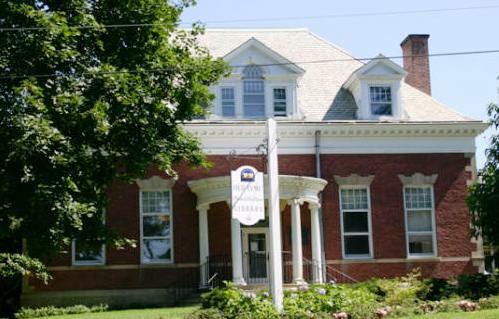 Significantly, the library has secured a $1.0 million construction grant from the Connecticut State Library, thus dramatically reducing the impact of the funding required for the project on Old Lyme taxpayers. Moreover, the library has committed to raising $300,000 through its own efforts. 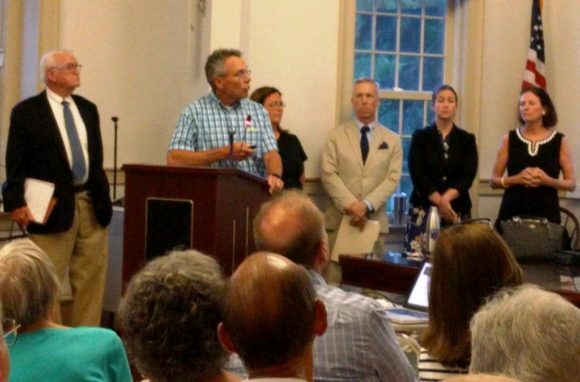 The library is requesting $1.75 million from the Town of Old Lyme. 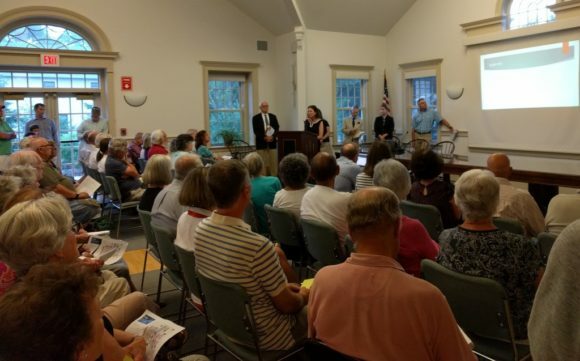 If this request is passed at Monday’s Town Meeting, the impact on the owner of a house appraised at $347, 200 is estimated conservatively at $24 for the 2019-20 tax year. The respective number for a house appraised at $540,200 is $38. 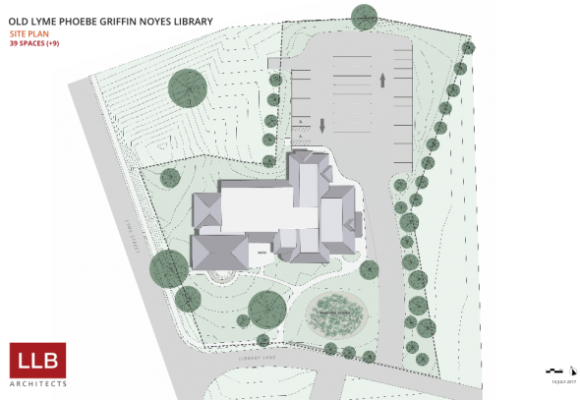 The site plan of the proposed renovation which shows no change to the current footprint of the library. It is anticipated that if the request for funding passes this evening, construction will start in early 2019 and be completed by the fall of the same year. For more information on the library renovation proposal including the opportunity to view the library’s slide show presentation, visit this link. The second item on the agenda for the Special Town Meeting is a proposed ordinance to amend the Town’s Harbor Management Plan. This ordinance will create a procedure for the Harbor Management Commission to recommend variances from the Harbor Use Zone Standards of the Plan to a state or local permitting authority acting on an application to conduct activities affecting the waters of Old Lyme. A copy of the proposed ordinance is posted on the Town’s website and paper copies are available for review in the office of the Town Clerk. 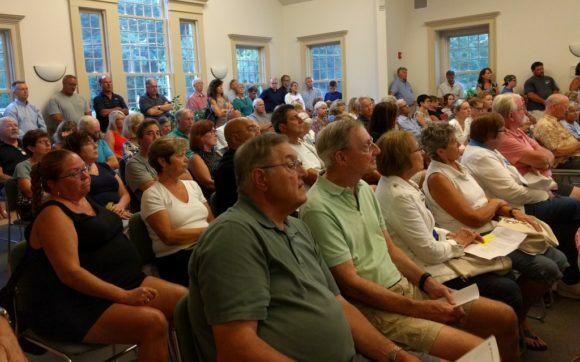 If approved by the Town Meeting, this ordinance will be effective 15 days after its publication in a newspaper having a circulation in the Town of Old Lyme. 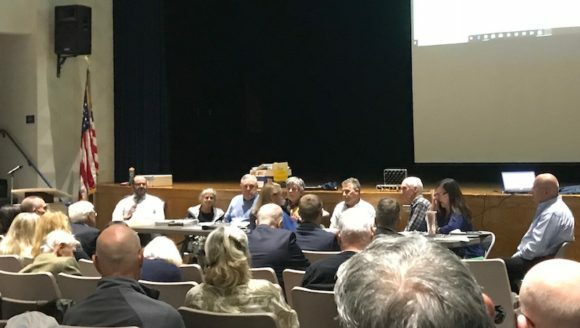 Old Lyme residents unanimously approved both the Town’s proposed $36,301,175 budget, and also an amended and restated retirement plan for the Old Lyme Fire Department, Inc. and Old Lyme South End Volunteer Ambulance Association, Inc. at the annual town meeting held last night in the Lyme-Old Lyme Middle School auditorium. Acknowledge receipt of the Town of Lyme Annual report for the Fiscal Year ending June 30, 2017. Acceptance of the Emerson Cemetery property from the Jewett family to the Town of Lyme. Consider and approve the Town joining an approved Connecticut Health Department or approved Connecticut Health District. Consider and repeal of the 1968 ordinance relating to Public Health in the Town of Lyme. Consider and act on estimates and recommendations of the Board of Finance for the Fiscal Year ending June 30, 2019. There are expected to be several votes during the meeting. All residents and citizens qualified to vote in a Town Meeting must be present if they wish to vote. Firing a three-round salute to honor all US Veterans. 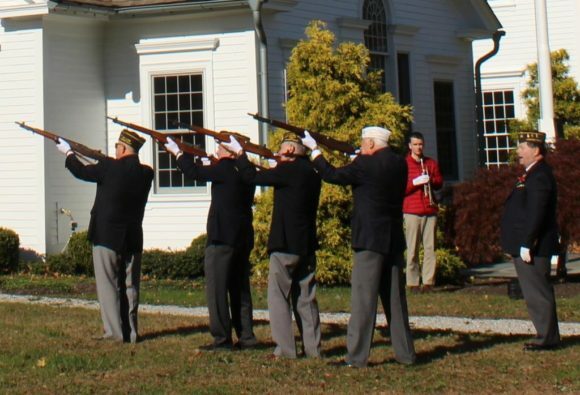 Despite the bitterly cold weather last Friday, a brief but touching ceremony to honor the nation’s veterans was held outside Old Lyme’s Memorial Town Hall led by members of the Lymes’ Veterans of Foreign Wars (VFW) Post #1467. Larry Olsen, Commander of Post #1467, (at left in photo above) gave introductory remarks and offered prayers. 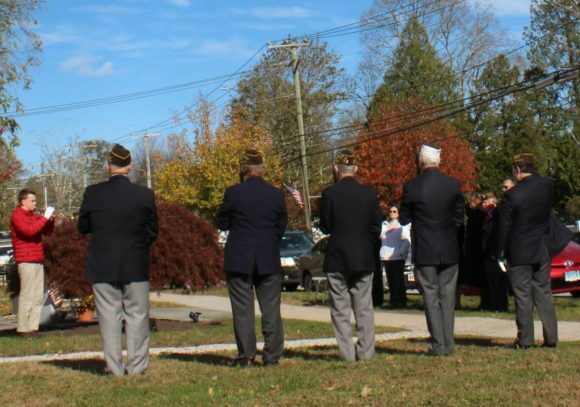 He was joined by fellow VFW members in uniform, the newly-re-elected Old Lyme First Selectwoman Bonnie Reemsnyder (in white jacket in photo above) and a number of local townspeople. 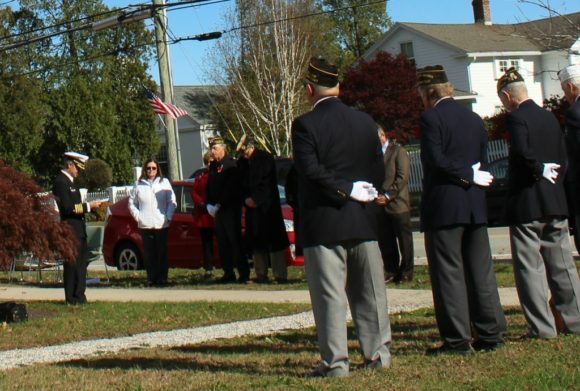 A three-round salute was fired and then a Lyme-Old Lyme High School student (in red jacket in photo below) played ‘Taps’ followed by a second student playing the echo. Finally, when the ceremony was concluded, the veterans were no doubt relieved to go into the town hall for some well-earned refreshments … and warmth! 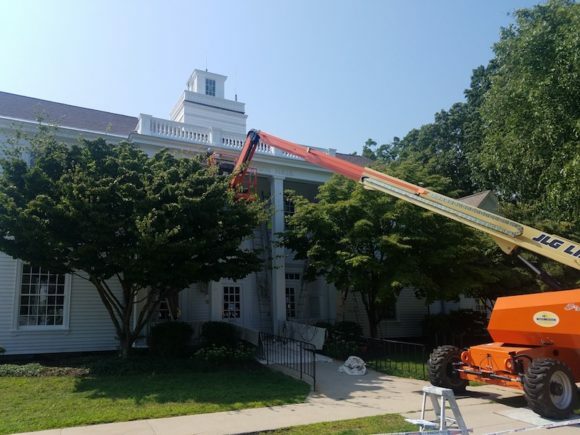 The Old Lyme Board of Selectmen is holding a Special Meeting this morning at 9 a.m. to review the updated draft Blight Ordinance with the town attorney, zoning and building officials, fire marshal and Ledge Light Health District Sanitarian. The second item on the agenda is to review the review the draft lease agreement for the pump station with town attorney. Painters from Martinez Painting work on the upper sections of Old Lyme Town Hall. 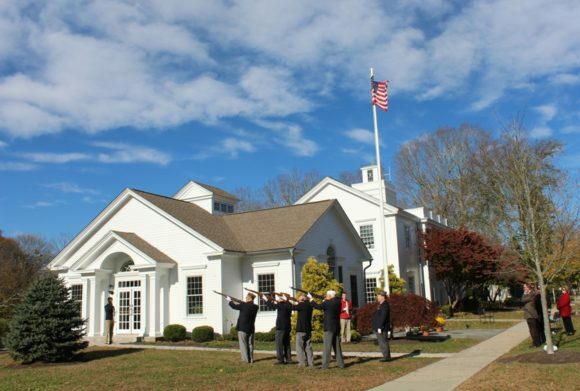 During 2007-2008, Old Lyme’s Memorial Town Hall was renovated and an addition built, providing ADA accessibility and mechanical upgrades as well as expanded space. The results pleased both staff and visitors but that was nearly 10 years ago, and in some areas, the paint on the older portion of the facility failed to adhere. It also became apparent that many of the plantings along the building were too close to the exterior siding and this, in combination with the passage of time, caused a number of areas of rot and deterioration. 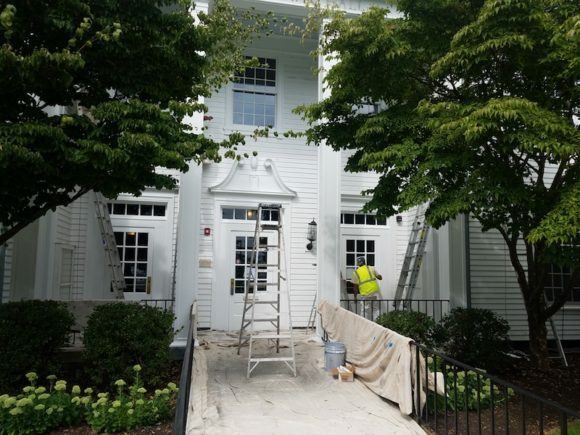 The front entrance of the Old Lyme Town Hall is being refreshed with a new coat of paint. This summer, the exterior of the building was power-washed and the deteriorated skirt and corner boards (which contained lead-based paint) were removed. These latter will be replaced with material that resists rot and is appropriate for use at or near ground level. All remaining surfaces will be scraped, encapsulated and will receive two coats of fresh paint. 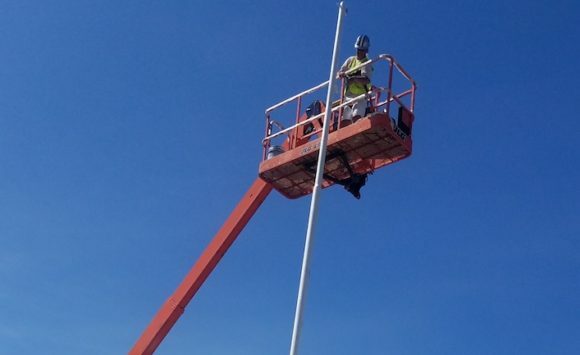 Even the flag pole gets a fresh coat of paint! 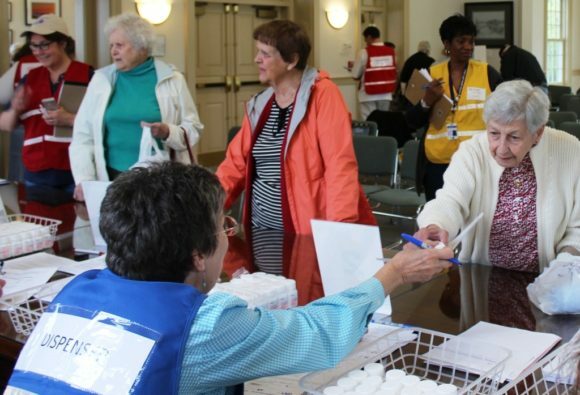 The contractor for project, which started Aug. 1 and should be completed by Sept. 10, is Martinez Painters of Clinton, Conn.
Joanie Bonvicin receives her “medication” from a Visiting Nurse in Old Lyme Town Hall during the Mass Dispensing Exercise held Tuesday. 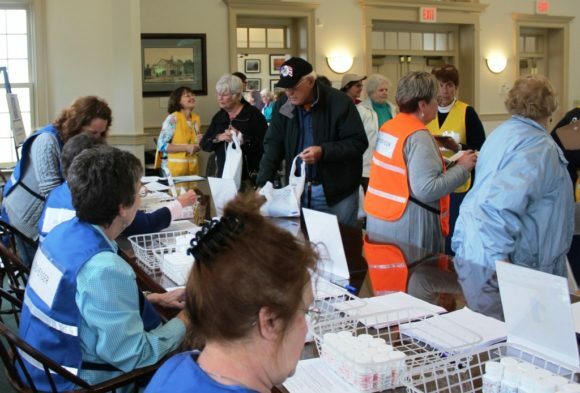 On Tuesday, June 6, Old Lyme’s Memorial Town Hall was the site of the first full-scale, mass dispensing exercise in the state. The goal of the exercise was to simulate a realistic outbreak of anthrax, one of the more likely agents to be used in the event of bioterrorism, or any other agent that might be used in such an attack. 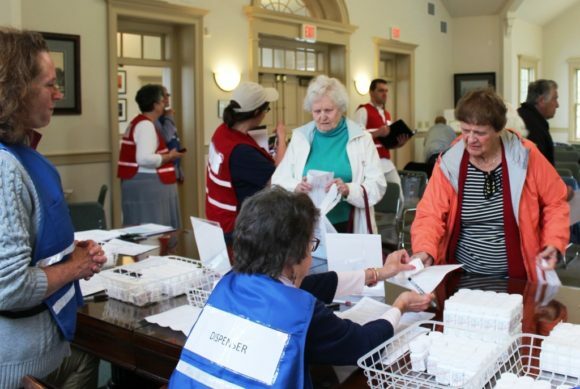 Old Lyme’s emergency preparedness made great strides through the completion of this exercise, and the Ledge Light Health District (LLHD) along with the Visiting Nurse Association were both vital contributors in the process. The exercise was successful in that the ‘throughput’ time between someone arriving at town hall and being dispensed with the appropriate medicine was reduced from over six minutes to approximately two during the morning. Some minor hiccups in the process were identified, which, when subsequently eliminated, enabled the process to be streamlined. Qualified evaluators kept a close eye on the practice, noting at each stage what worked and what needed improvement. Ledge Light Health District (LLHD) Operations Lead Kris Magnussen (center) answers a question from a volunteer during the Exercise. Mike Caplet, LLHD Region 4 Supervisor in foreground keeps a watchful eye on the process. Ledge Light Operations Lead Kris Magnussen, who is an Old Lyme resident, explained that measuring the throughput was important because, “It tells you how many people you can handle in an hour.” This, in turn, enables LLHD to be able to estimate the total number of people that can be dealt with in any specific period and to determine how many dispensing points are needed for a certain size of population. Busy times at the Dispensing Desk. 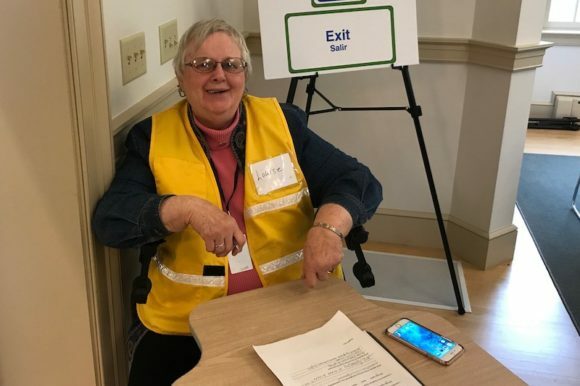 The participants in the exercise were town hall employees who volunteered to assist and seniors who were attending the Lymes’ Senior Center that morning and volunteered to be driven over to town hall to participate. This latter situation mimicked the likely situation in a real bioterrorism emergency of a group of people arriving together at the same time. Each participant was timed from their arrival in town hall through to their departure. As participants exited, they were asked a series of questions about their experience, with the aim of improving anything that could expedite or facilitate the process for them. Louise Wallace sits by the exit doors, where she questioned every participant, marking down their questions, concerns, and suggestions. Photo by J. Ballachino. I decided to test the process for myself. As I walked in to the town hall, I was quickly greeted and directed to the computer and printer station. Using Dispense Assist, an online screening tool, data regarding my age, weight, gender, and medical information were documented. Upon completion, a voucher was printed out for me to give to the volunteers at the dispensing station. Submitting this information took a few minutes, but this step can be expedited if the participant completes the form and prints the voucher before arrival. Vouchers can be found at http://www.dispenseassist.net/default.html. Once the voucher was given to the dispensing station, the volunteers quickly provided me an empty tablet container which in a real life situation would have contained the correct prescription of Doxycycline that I would need to take for the next 60 days, had I been exposed to anthrax germs. The correct “dose” of “medication” is handed to a participant in the Exercise. 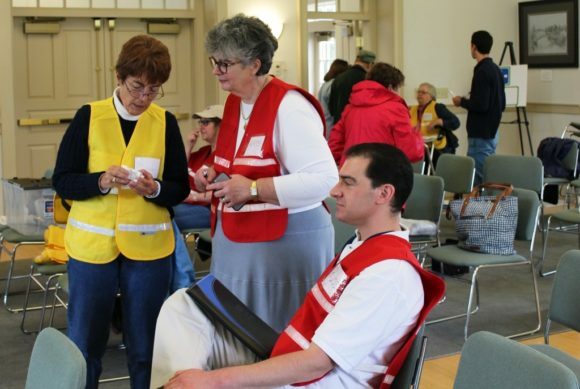 Residents of Old Lyme can be pleased that they now are a step up on other areas in regards to emergency preparedness. This mass dispensing exercise demonstrated to the LLHD how the town would be able to deal with a bioterrorism event, and identified which aspects of the exercise need improvement. The Town of Old Lyme holds its Annual Budget Meeting this evening at 7:30 p.m. in the Lyme-Old Lyme Middle School auditorium. 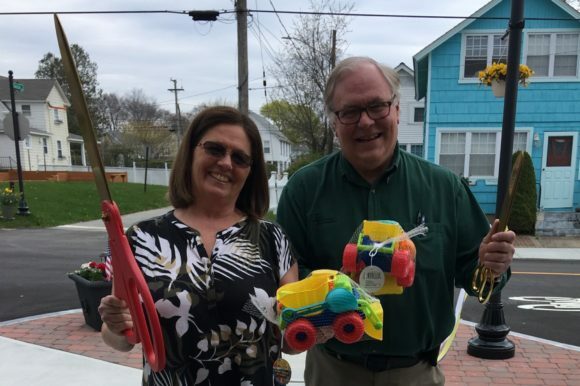 A vote will be taken on the town budget, which includes Old Lyme’s share of the Region 18 school’s budget, which was approved in a referendum on May 2. The agenda for the meeting is at this link. There are also board of selectmen meetings in Lyme and Old Lyme at 3:30 and 4 p.m.respectively this afternoon. The agenda for the Old Lyme Board of Selectmen meeting is at this link. Old Lyme Board of Finance Chairman Andy Russell presents the Town’s proposed 2017-18 budget at Monday night’s meeting. 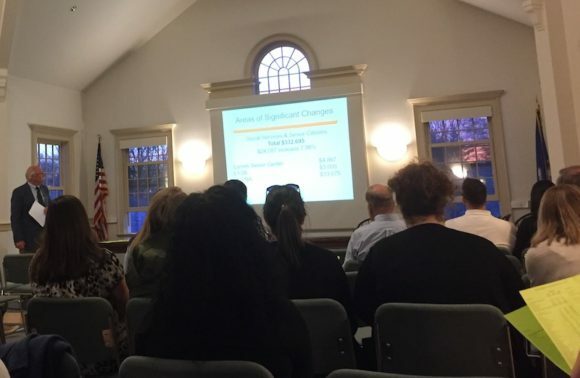 Around 30 residents showed up for Monday night’s public hearing in the Old Lyme Town Hall Meeting Room of the Town’s proposed budget of $36,355,031 for the 2017-18 fiscal year. 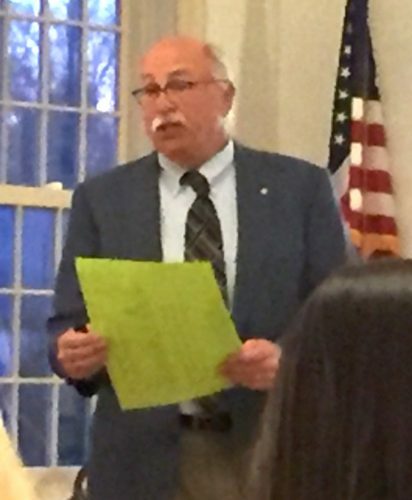 The proposed budget presented by Old Lyme Board of Finance Chairman Andy Russell, which includes $26.5 million for Lyme-Old Lyme (LOL) Schools, represents a 3.26 percent increase over the 2016-17 approved budget. The Towns of Lyme and Old Lyme divide the LOL Schools’ budget of $33,634, 371 between them based on percentages representing the respective number of students that each town has attending LOL Schools. The total LOL Schools budget for both towns reflects a 0.49 percent increase over the current year, but when translated exclusively to the Old Lyme budget, the sum represents a 3.65 percent increase over the current year’s figure. Old Lyme’s general government and capital budgets, which make up the balance of the Town budget (excluding the school budget), total $9,819,829 representing a 1.84 percent increase over the current year. This number comprises $8,774,129 for general government and $1,045,700 for capital spending. Russell summarized key increases and decreases in the the two sections of the budget, noting that regarding grants to non-profits , “The only one to receive an an increase is the Old Lyme Library.” He commented on the subject of Debt Service that “The only debt that the Town has relates to the Town Hall,” and that the period remaining on the debt is seven years. Renovations to the Hains Park bathrooms were originally included in the boathouse plans but now needed additional funding. Another project which received increased funding ($10,000) was a feasibility study to determine the viability of a sidewalk from Town Woods Park to Rte. 1/Boston Post Rd. Old Lyme Board of Finance Chairman Andy Russell answers a question about the Town’s proposed 2017-18 budget at Monday night’s meeting. Russell said the board of finance was proposing to take, “$800,000 out of surplus to soften the blow to taxpayers,” but adding, “$600,000 was taken out of surplus for each of the last two years … but not needed last year.” Adding, “We probably won’t need it this year,” he noted that the mill rate for 2017-18 is scheduled to increase from 21.2 to 21.75 mills, an increase of 2.58 percent. Russell cited three examples of how the mill rate will impact property owners. The first was for a house appraised at $347,200 and assessed at $243,000. This homeowner paid $5,152 in property taxes in 2016-17, but will pay $5,285 under the proposed mill rate next year. His second example related to a house appraised at $540,200 and assessed at $378,100. This homeowner paid $8,016 in property taxes in 2016-17, but would pay $8,224 next year under the proposed budget. Russell’s consistent message throughout the presentation was that the board always pursues a course that errs on the conservative side. As a result, he explained, the town enjoys the highest credit rating possible. Additionally, he noted that the board uses a predicted collection rate on taxes of 98.25 percent whereas the rate is, in fact, typically over 99 percent. When public comment opened, one resident asked if the cameras being installed in police cars would be transferable between vehicles and Russell confirmed they would. Russell responded that the question had been much discussed by the board and in the end, members had decided that since, “The Town had approved bathrooms and the boathouse,” the board should now add the necessary funds for the bathrooms into the budget. David Kelsey commented from the floor that this new sum to fund the bathrooms is now, “… buried in the budget.” Judith Read also questioned the boathouse project funding asking whether there was a surplus in hand on the boathouse project and if monies for the bathrooms were originally included in the boathouse project. 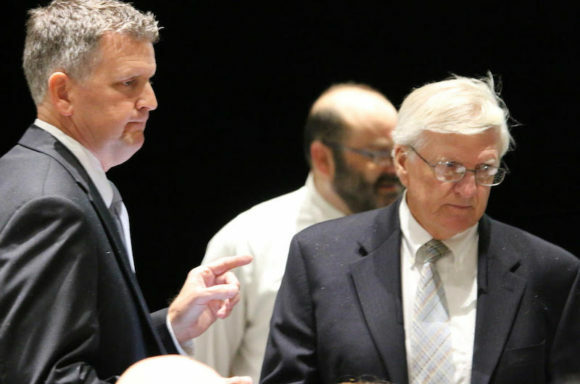 After the close of public comment, Russell said the proposed budget will now go forward for approval by residents at a town meeting to be held May 15. 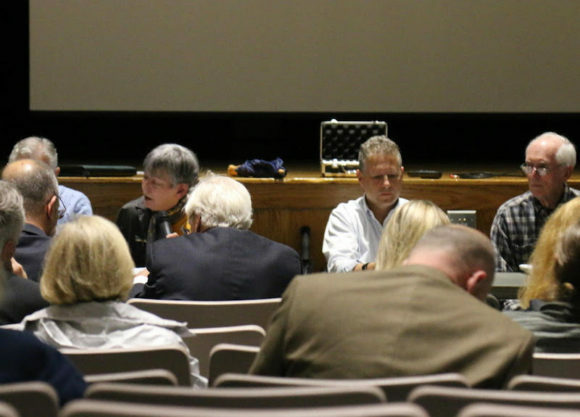 Prior to that, Lyme and Old Lyme residents will vote separately in a referendum on the Lyme-Old Lyme Schools $33.6 million budget to be held May 2. Voting will take place from 6 a.m. to 8 p.m. in both towns and the results from each town are combined to determine if the budget has passed. Voting in Old Lyme will be held in the Cross Lane Firehouse.